It’s often been said that out of nowhere just when things are at their bleakest, something happens to give you all the hope and strength needed to carry on. Yes pretty much a miracle, because it took place without much effort on your part. Staying true to who you are and continuing in a way that you would like other to treat you is to say the least summing it up. When people continue to disappoint you and make you feel unworthy of the air you breathe the trick is just to keep breathing. Sooner or later your prayers will be answered and you no longer have the need to go fishing for solutions to your problems where there are no solutions. 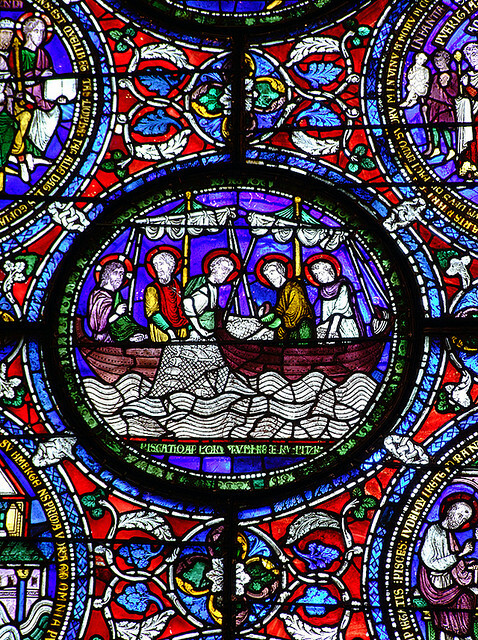 The beautiful stained glass scene of Jesus fishing with his disciples is a metaphor that sometimes things are too big for us to accomplish on our own, and so we begin to realize the need to reach out, and sooner or later your prayers are answered perhaps not in the form you expected, that’s what makes it a true miracle. So just when you think no one is listening, the Divine has a way of bringing you what you need. It’s an opportunity to correct anything in your life by accepting what the moment is offering even with all it’s challenges. Humility gives us the ability to listen and accept another view of things because the outcome is the gift of kindness by extending a helping hand when you need it the most. Our experiences are our teachers and when we let go and believe that someone out there is listening, the unknown unfold as it should, then we are in the realm of the beauty that comes from unconditional love and understanding. Knowing someone cares enough to take a chance on you is the force to manifest anything that before it seemed impossible. It only takes one act of kindness to change a persons life for the better. No act goes unnoticed especially those from a person whose heart is coming from a vibration of love and respect. Just as the light at the end of the tunnel is dimming and the fear of it going out consumes you, look again and see how beautiful it shines. Remember just when you think things can’t get any worse think again, it’s only the patience to allow the unfolding of a situation to occur can we understand the hidden meaning waiting for us to get. The hope for humankind is alive and well its just harder to find these days when everything is overshadowed by negativity, but never let go of the possibility that a miracle is just around the corner waiting for the right moment in time to reveal itself.